The Cycling World Hour Record is the most famous record in cycling, from 1893 to 2000 the best cyclists in the World have held the hour record including legends like Fausto Coppi or Eddy Merckx. In all these years the hour record has seen innovative equipment. But on september 9th 2000, the UCI (Union Cycliste Internationale – International Cycling Union) decided to create a “UCI Hour Record” as well as a “Best Hour Performance”. From that day, the UCI Hour Record was the one that Eddy Merckx achieved in Mexico on 25th October 1972, covering a distance of 49.43195 km. This UCI Hour Record can only be attempted if the equipment is presented and checked beforehand by the UCI and it must be similar to that used by Merckx. The records on this page are true “hour records” from 1893 until 1996!!! 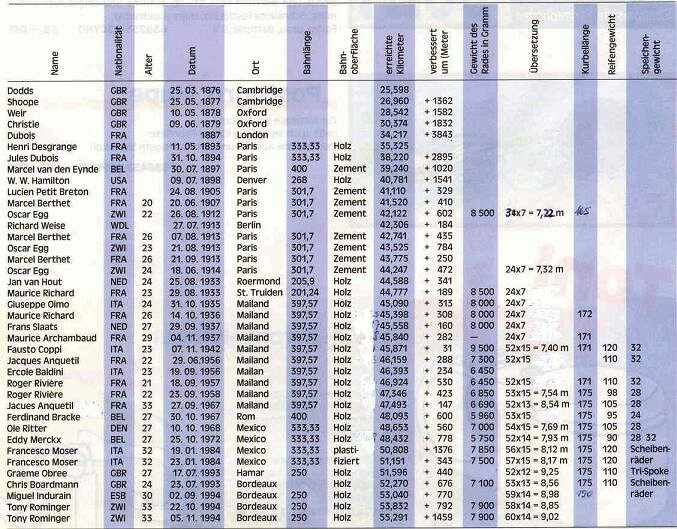 For the “new” UCI records look at UCI hour record page.